U.S. Secretary of State John Kerry defends the deal signed with Iran, says his country would never allow Iran to obtain a nuclear weapon. U.S. Secretary of State John Kerry on Saturday defended the nuclear deal signed in Geneva between the West and Iran. Kerry said that Iran with a nuclear weapons posed a "real" existential threat to Israel, but argued that the interim deal reached in Geneva halts progress of Iran’s nuclear program in exchange for a modest relief in sanctions. "You think $4 billion will make a difference?" Kerry said, adding that the most effective financial sanctions would continue to be in effect during the six-month timeframe of the interim deal. "Israel perceives a nuclear Iran as an existential threat. Why? Because it is," he added, but also claimed that Israel would be safer the moment the nuclear deal is implemented. Kerry further noted that the deal will allow western control of Iran's nuclear program, including inspection of plants and supervision of uranium enrichment. Naturally, the Secretary of State also addressed the ongoing peace talks with the Palestinian Authority, which restarted this past summer at his urging. Kerry claimed that besides Iran, another existential threat facing Israel is the "demographic time bomb" with respect to the Palestinian Authority. "Force cannot defeat or defuse the demographic time bomb. The only way to secure Israel’s long term future is through negotiations,” Kerry declared, adding that the Arab League would be ready to fully recognize Israel within borders that accommodate "realities" that have changed on the ground since the 1967 Six Day War, when Israel liberated Judea, Samaria and eastern Jerusalem. Kerry said Allen was working closely with Israeli forces to test scenarios and work out how to satisfy Israeli needs for years to come. "He is helping us make sure that the border on the Jordan River will be as strong as any in the world, so that there will be no question about the security of the citizens, Israelis and Palestinians, living to the west of it," Kerry said. Kerry’s keynote address came hours after President Barack Obama spoke at the Saban Forum, saying that there must not be another Gaza in the Palestinian Authority-assigned areas of Judea and Samaria. Israel pulled out of Gaza in 2005, as part of the “Disengagement”. This resulted in Hamas taking over the region and escalating rocket attacks at southern Israel. Obama warned that in the event of a final agreement between Israel and the PA, there would be a "transition period" to ensure that Judea and Samaria does not become a security threat akin to Hamas-ruled Gaza. He said that the PA would have to accept such a transition period. "The Israeli people can't expect a replica of Gaza in the West Bank," Obama added. "That is unacceptable." 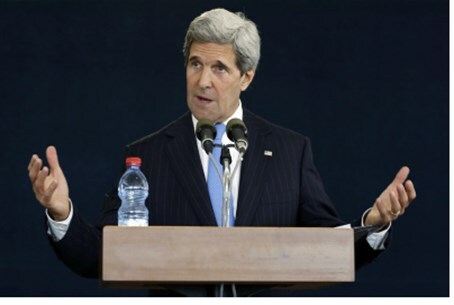 Kerry was speaking to the Saban Forum after returning from his latest visit to Israel. On Friday, before he left for Washington, Kerry told reporters that Israel and the PA were “closer than they’ve been in years” to achieving a peace agreement. Foreign Minister Avigdor Liberman poured cold water on Kerry’s optimism. Liberman, who spoke Friday night at the Saban Forum, said there was “zero trust” between the two sides. Liberman stated that peace talks between are unlikely to bear fruit within the envisioned nine-month timeframe but that dialogue should continue.